The Soave Consortium is made up of large and small wineries as well as bottlers and growers. Together they have 7000 hectares under vine. Garganega, the grape variety in Soave is very vigorous and needs to be reigned in to preserve white flower, citrus notes that are typical of Soave. Giovanni spoke with me about the changes in Soave, the studies being done by the consortium and a fascinating initiative that is in its third year, an event for only white wines made on volcanic soils that takes place in June in Soave called Vulcania. This video in Italian is truly interesting. Attilio Scienza a very well known enologist and professor in Italy talks about the different regions in Italy which have volcanic soils and what these soils bring to the wines that are made there. Ponchia noted that the best Italian whites are made on Volcanic soils be they in the Veneto, in Soave, around Etna in Sicily or Mount Vesuvius in Campania. Additionally both Friuli and Alto Adige have volcanic soils and both areas make great white wines. I hope to be able to attend one the next editions of Vulcania. 2011 will be the third year that Soave holds this type of conference. Ponchia explained that volcanic soils are great for grape growing because they are fertile as well as porous. The soil holds water well which can be very useful during times of little rainfall. Additionally, the soil releases the water slowly into the ground so it doesn’t get overwhelmed. Half of the Soave Classico region is made up of volcanic soil, the Eastern part of the DOC. Ponchia noted that most Soave is made from a combination of grapes from the Eastern and Western parts of the area. He also said that the Adige Valley where Soave is located in among the hottest areas in Northern Italy and for this reason, they use the pergola training system in order to protect the grapes from the scorching sun. Pergola is usually used in Southern Italy not in the North of the country. The Soave consortium never rests on its laurels and is constantly studying its soils and climate. On the website you can find a very detailed soil map of the area. 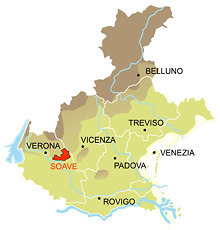 Soave is mostly sold in the Veneto and Italy and through export. Ponchia said that Soave isn’t too worried about competition from the New World despite the fact that they produce 70 million bottles a year. “We are very competitively priced, have high quality, and indigenous grapes that make out wine totally unique and a great option both for large retail stores and restaurants,” he said. Garganega, the grape that Soave is made from, only grows in the Veneto and a small bit in Sicily. The Sicily version however doesn’t have the same acidity. This is a great post about Soave. Educational and informative and makes me want to drink more. 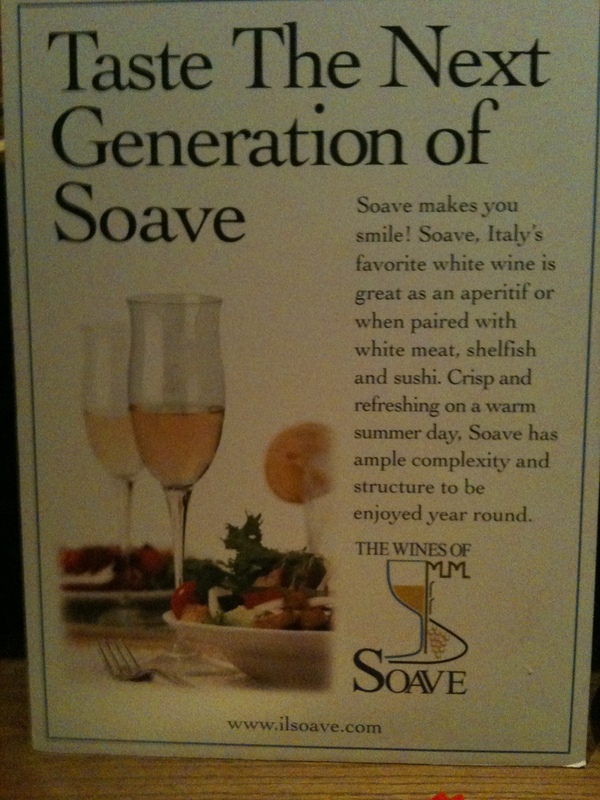 Soave, that is. The comments about volcanic soils is particularly interesting and gives a good reason why Friuli and Alto Adige makes such superb white wines.